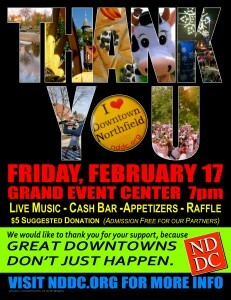 It’s the NDDC’s annual thank-you to our partners…and celebration of Downtown Northfield. Doors open at 7 p.m., at the Grand Event Center. There’ll be live music, free appetizers, a cash bar, a low-key raffle, and a whole bunch of your friends and neighbors. So come on down(town) and celebrate with us, this Friday night. 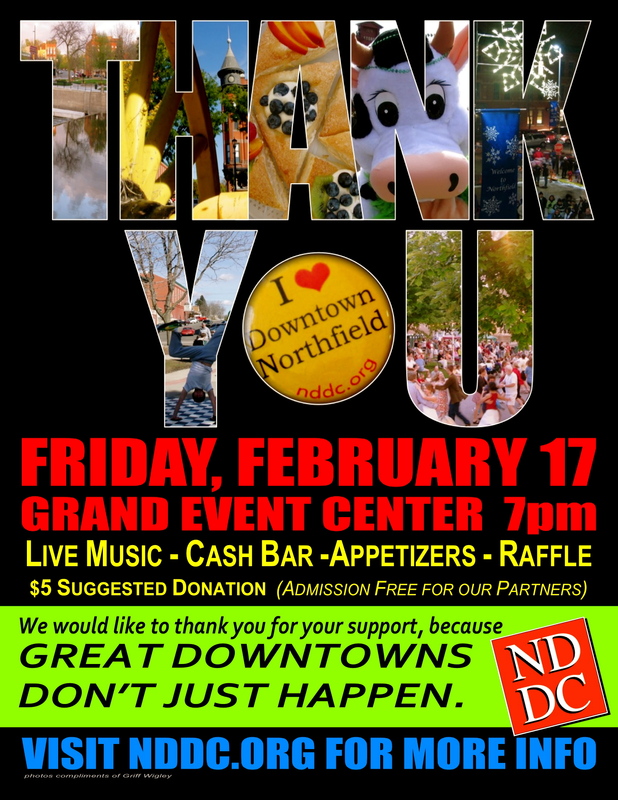 Friday, February 17th: NDDC Downtown Celebration, 7:00 – 11:00 p.m., Grand Event Center; 6th Annual Northfield Winter Stomp, 7:00 – 10:30 p.m., National Guard Armory; The Melvilles, 7:00 to 9:00 p.m., Hogan Brothers; Arsenic and Old Lace, 7:30p.m., Northfield Arts Guild Theater; Dan Israel, 8:00 to 10:00 p.m., Contented Cow; Matthew Griswold, 8:00 to 11:30 p.m., Tavern Lounge; Martin Devaney, 11:00 p.m. to 1:00 a.m., Contented Cow; and Karaoke, 9:00 p.m., Rueb’N’Stein. Saturday, February 18th: Toaster Fork!, 5:00 to 7:00 p.m., Contented Cow; Tim Fast, 7:00 to 9:00 p.m., Hogan Brothers; Arsenic and Old Lace, 7:30 p.m., Northfield Arts Guild Theater; Farragut North, 7:30 p.m., Weitz Center for Creativity on the Carleton College downtown campus; Relativity, 8:00 to 11:30 p.m., Tavern Lounge; Optimum Trajectory, 8:00 to 11:00 p.m., Contented Cow; D. J. Music, 9:00 p.m., Rueb’N’Stein; and The Ted Pretzel Experience, 11:00 p.m. to 1:00 a.m., Contented Cow. Sunday, February 19th: Arsenic and Old Lace, 2:00 p.m., Northfield Arts Guild Theater; Politics and a Pint, 6:00 p.m., Contented Cow; and Quiz Night, 8:00 p.m., Contented Cow.